Movie Review - 'The Adventures of Tintin' - Kenneth Turan Seamlessly blending innocent wonder with the most worldly and sophisticated technology, Steven Spielberg's motion-capture adventure tracks the Belgian hero on a global quest. 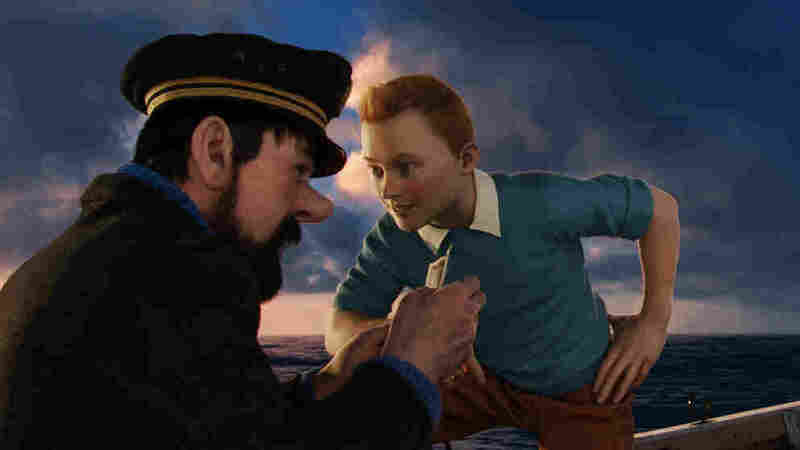 Captain Haddock (Andy Serkis, left) and Tintin (Jamie Bell) chase fortune and treasure in The Adventures of Tintin. Tintin — star of a series of vintage Belgian comics that have sold hundreds of millions of copies in dozens of languages — is a crime-fighting boy journalist who specializes in solving riddles with the assistance of his intrepid dog, Snowy. Now, in The Adventures of Tintin, he's come to the big screen, in a tale of derring-do in distant lands that revolves around hidden treasure and a secret scroll that Tintin has and the bad guys want. These adventures are presented in an up-to-the-minute blend of 3-D computer animation and performance-capture technology — a complicated process overseen by a pair of filmmakers, director Steven Spielberg and producer Peter Jackson, who've always kept their inner children close at hand. These technologies prove to be just the ticket for Tintin's exploits. They create a good-humored, high-spirited world that is delicately poised, just as it should be, halfway between the cartoon and the real. And they mimic the elegant visual detail and vibrant color that generations of readers have fallen in love with in the original stories. Performance capture has also done surprisingly well by Tintin's actors. Jamie Bell plays the young journalist, and performance-capture veteran Andy Serkis (Lord of the Rings, Rise of the Planet of the Apes) co-stars as Tintin's unlikely ally, the inebriated old sea dog Captain Archibald Haddock. What makes The Adventures of Tintin special is the seamless way it combines innocent wonder with the most worldly and sophisticated technology. That makes for scenes and camera movements that don't look like they'd be possible in the real world. No one does this kind of thing better than Steven Spielberg, and the child in us all couldn't be more pleased.